The form of packaging called 8-9-8 is used for some cigars in the Partagas and Ramon Allones brands. These boxes are polished, have curved edges, and contain 25 cigars, arranged in three layers with eight at the bottom, nine in the middle and eight on the top. Cigars with this sort of packaging are relatively expensive. JM stands for Jose Marti, formerly H. Upmann. FPG stands for Francisco Perez German, formerly Partagas. BM stands for Briones Montoto, formerly Romeo Y Julieta. FR stands fro Fernando Roig, formerly La Corona. EL stands for El Laguito. Havana boxes also used to be stamped with the color of the cigars contained in them, but this practice has stopped, for the time being at least. Boxes, in the past, often read "claro," but this color classification was frequently inaccurate. 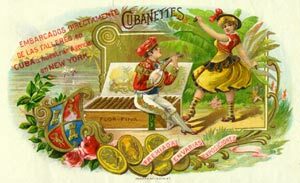 The cigar band was introduced by the Dutchman, Gustave Bock, one of the first Europeans to get involved in the Havana cigar industry, somewhat after the introduction of the cigar box and labels, and for the same reason: to distinguish his brand from the many others on the market. His lead was soon followed by all the other brands, and cigar bands are still used by almost all handmade brands. When bands were originally introduced, other manufacturers followed Bock's example and had them made in Holland. Some cigars, sold in "Cabinet Selection" packaging--usually a deep cedar box containing a bundle of 50 loosely packed cigars tied together with silk ribbon--are sold without bands. This "half-wheel," as it is called, of 50 cigars is the way cigars were normally presented before the band was introduced. Some Honduran handmades are also often sold in Europe without bands (and usually singly), primarily for trademark reasons. The band also has other minor functions, such as protecting the smoker's fingers from becoming stained and some claim, holding the wrapper together--though no decent wrapper should need help. The cigar bands of older brands tend to be much fancier (with gold leaf in abundance) than those of modern brands. Those aimed at the very top of the market in particular--Cohiba, Dunhill, Montecristo and Davidoff, for instance--are all simple and elegant. The bands on non-Havana cigars with Cuban brand names tend to be similar to the Cuban originals, although they vary in small details ( a typical one being that they bear the date of origin of the brand in the space where the Cuban version says "Habana"). Some Cuban brands use more than one band design, Hoyo de Monterrey, for instance, or Romeo Y Julieta, where the Churchill sizes have a simple , slim gold band, but other sizes have red ones. The question of whether to smoke a cigar with the band on or off is purely a matter of personal choice. In Britain, it has traditionally been considered a matter of "bad form" to advertise the brand you are smoking, an inhibition which doesn't apply in Europe or the United states. If you insist on removing the band, it is best to wait until you have smoked the cigar for a few minutes. The heat of the smoke will help to loosen the band from the wrapper and will make the gum on the band less adhesive and easier to remove. If you try to take the band off the cigar before starting to smoke it, you will risk damaging the wrapper.